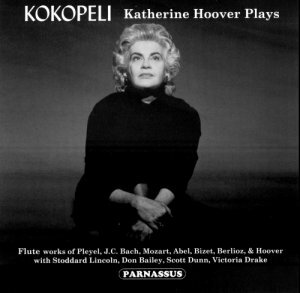 The disc includes three of Hoover's most popular flute works, newly performed by the composer--her first recordings of these pieces. The title work, Kokopeli, has already been recorded eight times previously, an unusual distinction for music composed as recently as 1990. Like Kokopeli, Winter Spirits is a work for unaccompanied flute. Pianist Scott Dunn accompanies Hoover in her suite Masks. The recordings were made digitally in l999/200O specifically for this CD. The disc features a program titled "London Diversions," recorded in 1968 for the obscure Sonar label and newly remastered from the original master tapes. In this early period instrument recording, Hoover plays a 1911 wooden flute in music of Pleyel, J.C. Bach, Mozart, and Abel, each work chosen for its musical merit as well as its London associations. Her collaborator, Stoddard Lincoln, plays a Hester fortepiano, a copy of an Anton Walter instrument. The disc also includes two flute duets, recorded live in concert with flutist Don Bailey and harpist Victoria Drake. The Entr'acte fiom Bizet's Carmen is heard in an early Delsaux arrangement, while the Trio of the Young Ishmaelites from Berlioz's L'Enfance du Christ is performed in its original scoring for two flutes and harp. Overall, the disc provides an impressive and entertaining portrait of one of the most distinguished musicians of our time.